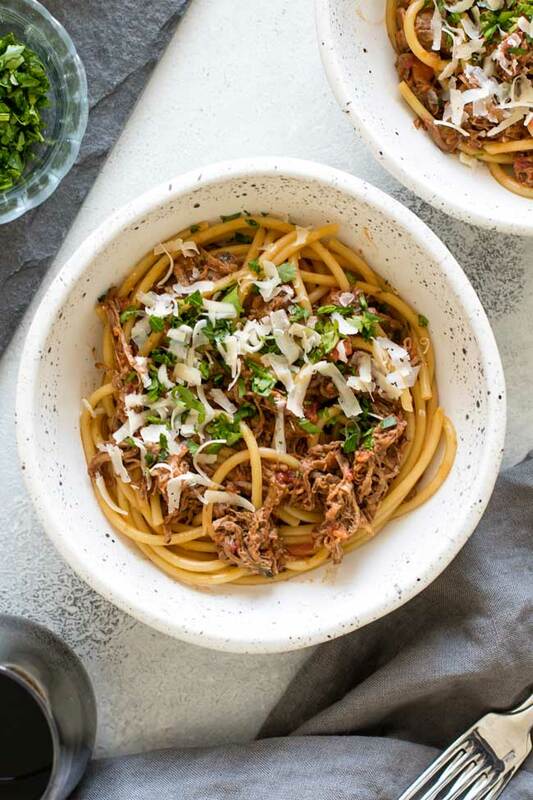 This hearty slow cooker short rib ragu simmers all day until the short ribs are falling apart tender. Serve it with pasta for a hearty and comforting winter dinner. If there’s any silver lining for this cold and dreary time of year it’s the excuse to use the frigid temperatures to make cozy and hearty dinners. I know a lot of people focus on healthier eating this time of year, which I admire, but to go the whole month of January eating only salads or other dishes that are more appropriate during the summer is depressing to me. I came dangerously close to trying Whole 30 (a short-term detox eating plan) before I remembered that the early (and freezing-cold) part of the year is hard enough without torturing one’s self by abstaining from all the delicious things that make this time of year more tolerable. And who am I kidding anyway? I love pasta. So no Whole 30 for me and, instead, I’m sticking to what makes me happy. And one thing that makes this time of year a little easier are slow-cooked dishes like short rib ragu. 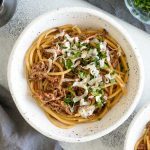 About four years ago, at the tail-end of the winter season, I shared a slow-cooked short rib ragu which is one of the most popular recipes I’ve shared to date. It’s a hearty and rich sauce made with red wine, veggies and tender short ribs that cooks for several hours in the oven until the beef is falling-apart-tender. I still love that recipe, but since then I’ve been asked many times if the recipe works in the slow cooker. So, here I am almost four years later with a slow cooker variation that’s similar but not exactly the same as the original. I’m not big on leftovers except for dishes like this short rib ragu. It keeps well in the fridge or freezer and you can serve it with different things – I’ve had this short rib ragu tossed with pasta, served alongside roasted cauliflower, and I imagine it would be delicious spooned over rice or mashed potatoes. So, this recipe yields six generous servings. It starts with 3 pounds of boneless beef short ribs. This isn’t a dump-everything-in-the-slow-cooker-and-go recipe because it’s important to get a good sear on the short ribs before simmering them all day. The browning step adds lots of flavor and you can do this step on the stovetop in a large skillet, which is what I used to do before I got a slow cooker (a 6-quart Cuisinart model) that has a saute feature. Once the ribs are browned remove them from the pan. Add the carrots, celery, onion, and garlic and cook them in the pan, scraping up all the browned bits left behind by the ribs. Add some tomato paste and all-purpose flour, which will help thicken the sauce as it cooks. At this point, all of the veggies go into the slow cooker. Add some plum tomatoes and fresh thyme and then nestle the browned short ribs into the sauce. Cook the ribs on low for six to seven hours or until they easily shred with a fork. My original oven-cooked short rib ragu had a lot of red wine, which works really well when you cook the ragu in the oven because it reduces down while it cooks. Because the sauce doesn’t reduce in a slow cooker (all of the moisture is trapped inside by the lid) I use a lot less liquid for this recipe. So, instead of red wine, I stir in a few tablespoons of balsamic vinegar after the ribs are cooked and shredded. It adds a pop of tanginess to the sauce as the red wine does for the other recipe. As is the case with most of my recipes, I love to stir in some chopped fresh parsley before serving the sauce. Also, it’s not a super saucy sauce – if you serve it with pasta ( I recommend a long pasta shape like spaghetti or bucatini) the sauce will just lightly coat the pasta. Stay warm and happy slow-cooking! 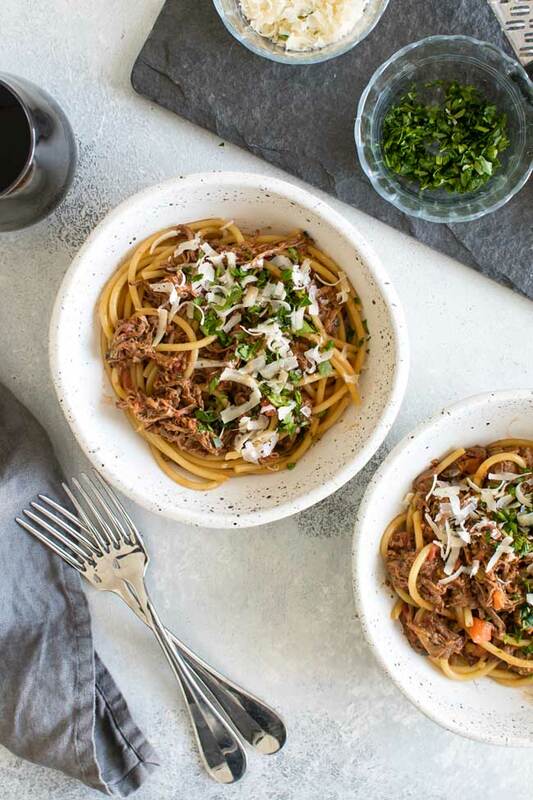 This hearty slow cooker short rib ragu simmers all day until the short ribs are falling apart tender. I like to serve it tossed with pasta, but it’s also delicious served alongside some roasted cauliflower. Or, try it spooned over rice or mashed potatoes. 3/4 teaspoon kosher salt, or more to taste. In a large skillet, heat the oil over medium-high heat. Brown the short ribs for about five minutes on each side until they develop a dark golden crust. If needed, brown them in batches otherwise it will be difficult to get a good sear. Remove the short ribs from the pan to a clean plate. In the same pan, cook the carrots, celery, onion, and garlic for about five minutes. As they release their moisture scrape up the browned bits off the bottom of the pan. Add the tomato paste to the pan and stir until it’s evenly coating the vegetables. Sprinkle the flour over the top of the veggies and stir to coat them. Transfer the veggies to a 6-quart slow cooker. Gently break apart the tomatoes by giving them a little squish. You can do this in a separate bowl or as you place them in the slow cooker. Pour all of the juices from the tomato can into the slow cooker. Stir to combine the veggies with the tomatoes. For the thyme, you can scatter the whole sprigs in the slow cooker over the tomatoes or, if you don’t want to worry about fishing out the stems later, remove the leaves first and discard the stems. Place the short ribs, in a single layer, in the slow cooker. Nestle them down into the sauce so they are mostly covered by it. Place the lid on the slow cooker and cook the short ribs and sauce on low for 6 to 7 hours or until the short ribs are tender and shred easily with a fork. Once the short ribs are tender, shred them with forks right in the slow cooker (fish out the thyme stems, too). The sauce will thicken a bit as you do this. Add the balsamic, salt and chopped parsley and stir to combine.